Sometimes I wish I were a sloppier person, because projects would take a lot less time if that were the case. I finished scraping the last of the wallpaper off around 5:30 this evening. 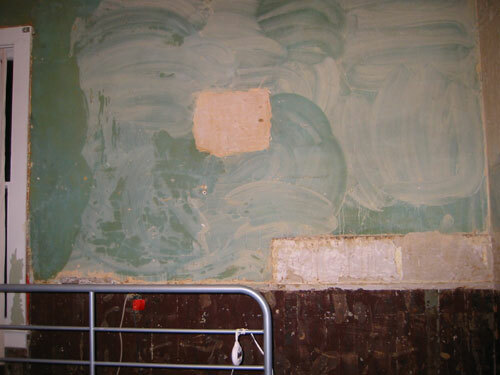 Then I thought I would just wash the walls and start repairing plaster. But no. See this nice buttery creamy colour? 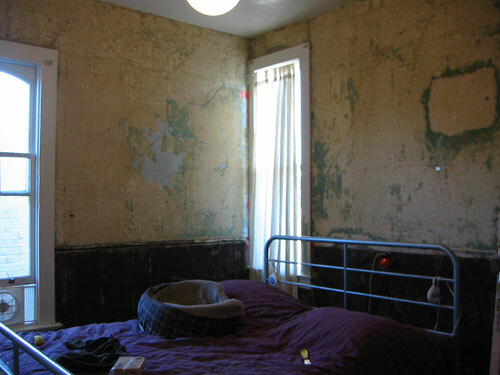 That's 100-year-old wallpaper paste. It melts charmingly in water (thank goodness), but it's about 1/32 of an inch thick around the whole room, so I've been dampening it, then scraping it off, then washing the wall down with the sponge. So washing down the walls is taking about ten times longer than predicted. And I still need to re-wash all of them with TSP when I'm done removing the paste, because as you can see here, the stuff gets smeared around quite a bit by the washing process. I'm hoping that if I do this in two passes -- the first one to remove most of the bulk of the stuff, and the second one to actually wash the walls -- that will reduce the number of times I need to go up and down the ladder on the second round. Another snag: once the stuff is off the walls, it sticks to everything. I think we might have a new pattern on the (cheap industrial) carpet in the bedroom. We definitely have a cleanup problem in the hose of the Shop Vac. Now I'm exhausted, and I'm planning to work on the room all day tomorrow, so I'm off to shower and then to bed (in the middle of the construction).